Humans have migrated for thousands of years and most of us come from somewhere else. Some are lucky enough to know exactly where all our ancestors came from, but others like myself have searched on-line for clues or have crept around old graveyards looking for links only to come to a complete dead end. 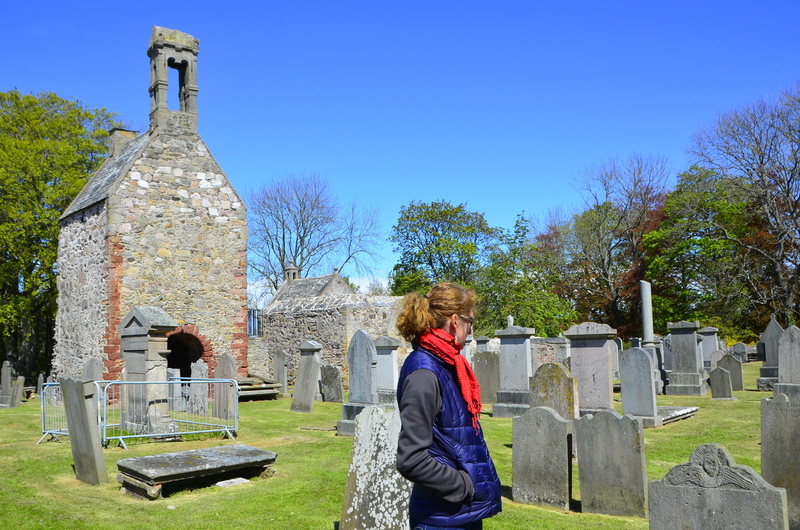 Creeping around the grave yard next to King Edward Parish Church near where most of my Scottish ancestors on my fathers maternal side were born. A couple of small Christmas gifts arrived in our mailbox just before Christmas. Enclosed were two genetic DNA test kits. To date this has been one of the most interesting gifts from my mother-in-law. Before this gift, it was an Easter Island statue head Kleenex box cover. My husband and I laughed about taking the DNA test because our inside joke to each other is that we must be related since we think alike, we can answer a question before the question is asked, and both our mothers’ families emigrated west from Kansas during the depression. Twins separated at birth? Ewww! Of course, I’m just kidding about this since I’ve got an actual twin brother who was born just minutes before me. Even though we are just fraternal twins, on two separate occasions we purchased and sent our mother the exact same birthday card. What are the odds of that happening twice when we live hundreds of miles from each other. Genetic? First thing on Christmas morning my husband and I spit into the tiny clear DNA vial, up to the black line as instructed, and then shut the lid to mix with the enclosed liquid to stabilize our DNA. Initially, I was hesitant about sending my DNA to complete strangers. I guess I’ve been watching too many old X-Files episodes about secret government and alien experiments. We don’t have anything to hide, so what’s the worst thing that could happen, my DNA will be baptized against my knowledge in the future? The following day we put our DNA in the mail and sent it back to Ancestry’s Utah lab. 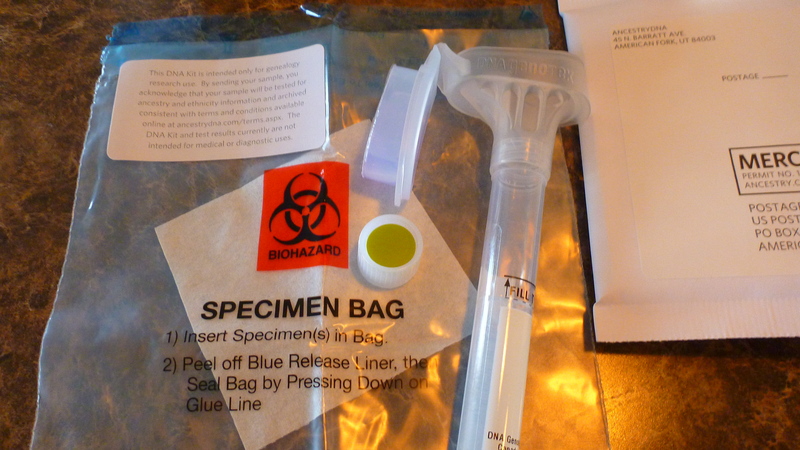 Six weeks later, I got an email that my DNA sample was rejected. Producing saliva on command shouldn’t have been that hard but mine was rejected because, I admit, it had too many bubbles and the spit to liquid ratio was probably off. Ancestry sent me another kit and I repeated the process again, this time being extra careful to fill it properly. Last week, I received an email that my DNA results were in. I was very excited to see them but wasn’t totally surprised of the results since I knew most of my family migrated from Europe. 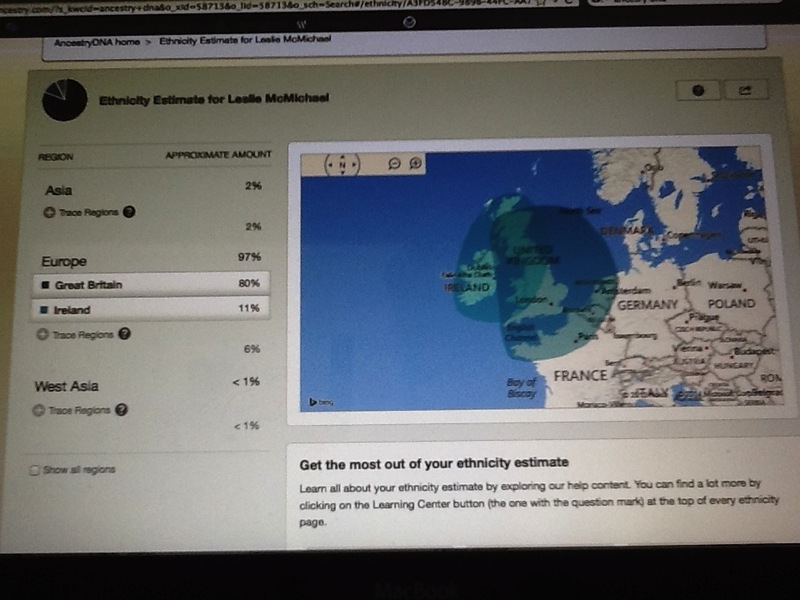 Yes, it was confirmed I’m a mutt. 80% of my DNA is from Great Britain (England/Scotland), 11% Irish, 2% Asia (India), and the rest of the trace regions European East and European West (Germany). I had no idea that any of my family came from Ireland. Maybe, this is my missing link on my fathers paternal side? The good thing about Ancestry.com is that because of its massive data base of information, it linked me to two second cousins who took the test whom I don’t recall ever meeting. This proved that the test is spot on. What a tool for adopted children if they so choose to go this route. In this crazy world we live in, I think we just simply want to feel connected to something or someone. Oh, and more good news: my husband and I aren’t even close to being related (except by marriage) and my 11% of Irish genes will soon officially celebrate St. Patty’s Day with a little “Danny Boy” and “Irish Washerwoman” on the Celtic bagpipes along some corned beef and cabbage washed down with some green beer.